I do what I can to convey what I experience before nature and most often, in order to succeed in conveying what I feel, I totally forget the most elementary rules of painting, if they exist that is. In short, I allow faults to appear, the better to fix my sensations. I have had this little sign hanging in my studio for the last 16 years [over 20 years now], a rough reminder to myself when I begin to feel like my work is bending to the rules and judgments of others. It reminds me that I am working in my own realm, my world. I control the parameters of what is possible, of what defines reality in my work. The rules of others mean nothing in my little painted world. Over the years I have glimpsed this small sign at times when I have been feeling that my work is stagnating or beginning to adhere to accepted conventions. At those times I have been spurred to push my work in some new direction. It might come in the form of heightening the intensity of color or introducing new hues that seems incompatible with nature, for example. It’s as though these two words are prods that constantly tell me that nobody can control me when I am here in my created world. There’s a great liberation in this realization and I find myself trusting my own judgment of my work more and more. Because I have created my own criteria for its reality, criticism from others means little now. I think that’s what I am trying to get at here, that an artist must fully believe that they are the sole voice of authority in their work, that they, not others, determine its validity. Maybe that’s why I am so drawn to Outsider artists, those untrained artists who maintain this firm belief in their personal vision and create a personal inner world of art in which it can live and prosper. Rules mean nothing to them- only the expression of their inner self matters . I’ve either never read that quotation, or never felt its truth so keenly. I often hear photographers talking about the rules for their art, especially the rules for composition: anguishing because they’d forgotten to “obey” them. In one or two cases, I’ve seen their level of satisfaction with playing by the rules increase, even as the vitality is drained from their work. 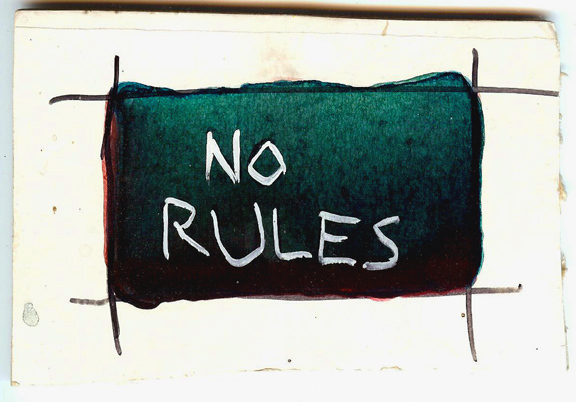 I’ve been thinking about this subject this morning and I think that in art “rules” tend to be templates that can be followed to create a successful piece of work. They are templates that we know and accept. But these “rules” are only the ones that we know. There may be other ways outside of the known and they can only be found by straying from the accepted way of doing things. I think your point about finding satisfaction by playing by the rules even while vitality is drained away makes a lot of sense. By following the rules there is a greater chance of creating an acceptable work but it doesn’t guarantee that the work will excite and inspire. The excitement that comes from the discovery of the new, something that strays from the known, far outstrips the satisfaction of following the rules.